Pasta, potatoes and rice... are all carbohydrates that cause a surge in blood glucose levels as they are broken down. For people with diabetes, these surges in glucose can be tricky to manage and cause problems over time. But what if simply changing the way these foods were prepared and cooked meant this was less likely to happen? An experiment on the BBC TV show Trust me, I’m a Doctor, led by Dr Denise Robertson (senior nutrition scientist at the University of Surrey), showed that eating cooled or reheated pasta – turning it into ‘resistant starch’ – could help to reduce the rise of blood glucose levels. At Positano Italian restaurant in Guildford, Surrey, 10 of the staff agreed to take part in an experiment, devised by Dr Robertson. Each of them ate one bowl of white pasta a day for three days. On each day the pasta was prepared in a different way (as follows) and topped with the same simple tomato sauce. After eating each bowl of pasta the participants measured their blood glucose levels every 15 minutes for two hours. 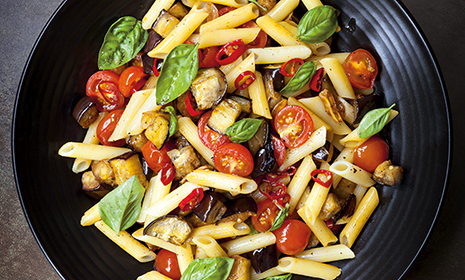 Eating freshly cooked pasta caused the biggest rise in blood glucose. Eating chilled pasta caused a slightly lower rise. Unexpectedly, pasta that had been cooked, chilled and then reheated caused the lowest rise of all. Starch is the most common carbohydrate in our diets and is essentially a chain of glucose molecules linked together. Raw starchy foods (e.g. raw potatoes) have a highly ordered structure and are hard to digest, but heating them in water weakens this structure, making it easier for the gut to break down each chain and absorb glucose into the blood. Glucose from cooked starchy foods, such as white rice, pasta and potatoes, is absorbed almost as quickly as glucose from a sugary drink. We say these foods have a high ‘glycaemic index’ or GI. However, when starchy foods are cooled their structure is reorganised again and the digestive enzymes in your gut can’t break them down as easily. The food now contains more ‘resistant starch’, which is not broken down and essentially becomes fibre. This explains why the chilled pasta caused a smaller rise in blood glucose – but why was reheated pasta even more effective? Dr Robertson warns that there are various ways of reheating food, at different temperatures and for different lengths of time and that this is a detailed part of the research that she is currently looking into. Dr Robertson is one of the world’s leading researchers of ‘resistant starch’ and, with funding from Diabetes UK, has studied its impact on people at high risk of Type 2 diabetes and people with Type 2 diabetes for the first time. According to Dr Robertson, there are two health aspects to ‘resistant starch’. ‘Resistant starch’ can dramatically increase the fibre content of your diet without affecting the appearance, taste or texture of the food and without you knowing the difference. Foods fortified with ‘resistant starch’ can give you the fibre equivalent of brown rice, brown bread or wholemeal pasta without changing your diet. One short-term effect of this is that it helps you feel fuller for longer after a meal. Dr Robertson is continuing her research in this area and emphasises there’s a lot of potential for ‘resistant starch’ but also a lot we still don’t know. … that a healthy, balanced diet is the best way to maintain a healthy weight and can help people to manage Type 2 diabetes or reduce the risk of developing the condition. Foods that include resistant starch add to this balance and allow individuals to incorporate more fibre into their diets. It is very important to follow food safety guidelines when cooling, storing and reheating foods in order to minimise the risk of potential food poisoning. Go to the home hygiene section of the NHS website for more information on this.